"Clergy on Corpus Christi in the village of Shangzhuangzi"
Clergy on Corpus Christi in the village of Shangzhuangzi. From left to right, front raw: Fr. Nicolas Wenders; Fr. 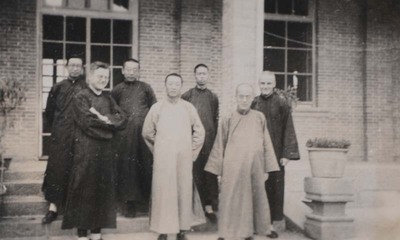 Joseph Liu 劉, pastor, a Chinese priest; back row: three Chinese priests; Fr. Paul Gilson. Clergy on Corpus Christi in the village of Shangzhuangzi. May 1932. Société des Auxiliaires des Missions (SAM) China Photograph Collection, Whitworth University Library, Spokane.